There are many opportunities to help support Rumsey while permanently showing appreciation for students, alumni and faculty, their achievements, skills and interests and noteworthy accomplishments. Thank you for being a part of these special programs. As Rumsey's performing arts program flourishes, so does the opportunity to applaud students engaged in drama and music, by naming a seat in the Maxwell A. Sarofim '05 Performing Arts Center in their honor. It all started with hockey and Broomball games on Rumsey's frozen ponds. And today, home ice is at our own Lufkin Rink— the center of a robust girls' and boys' hockey program. Salute your favorite hockey player, team or coach by naming them on the Lufkin Rink commemorative "Puck Wall" with a message of recognition on an engraved plaque and accompanying honorary puck. 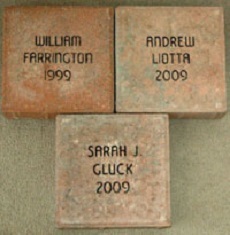 Honorary bricks engraved with the name and class year of Rumsey Alumni line Senior Square, the walkway of Upper School Street and the Finkelson Family Courtyard as a lasting tribute and celebration of our student's experience at the School. Each year, families of the current graduating class are invited to join in this tradition by naming a brick in their student's honor. New bricks are installed each May, just prior to Commencement.